This card is for a beloved tante (aunty) in Holland. Base - white cardstock scored with a Scorpal. Topper - Background is navy blue watercolour paper, dry emboss with the Cuttlebug, then swipe Silver Versamagic ink over raised areas and around edges. Use Martha Stewart Flower Bed Deep Edge border punch on pale green metallic self-swirl paper. 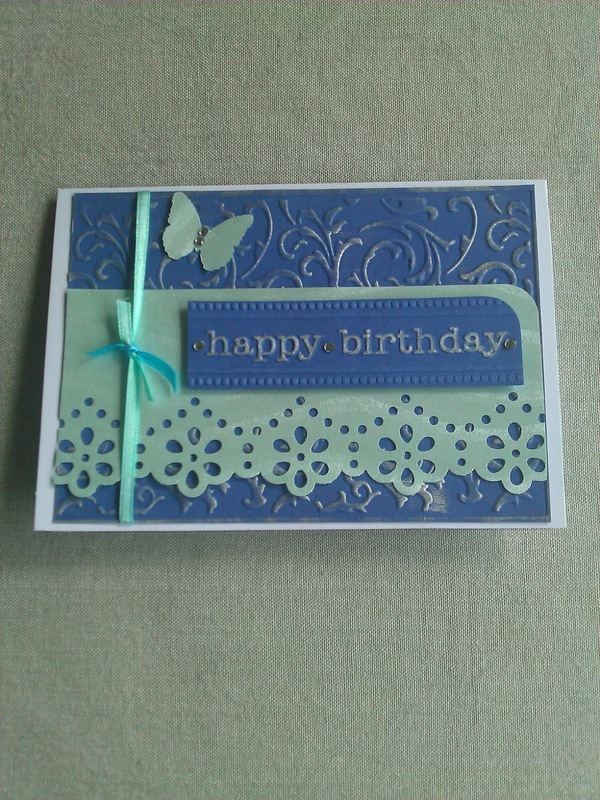 Dry emboss the sentiment with a Cuttlebug folder, then trace over the letters with a silver marking pen. 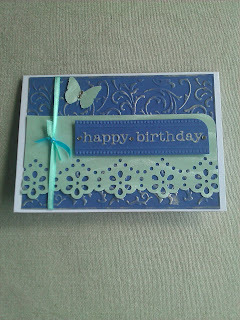 Mount sentiment on pale green paper with foam tape, after rounding one corner of each piece. To finish, tie a matching pale green ribbon around the topper, then tie a smaller knot-only piece in pale blue as shown. Punch a small butterfly. Embellish butterfly and sentiment with bling. I'm a full-time Mum, part-time Administrator, with a loving husband and two delightful (usually!) children, and I am loving card-making. Give me some pretty paper, a stamp or two, some rainbow colours, and a friend who needs love, and I'll go to it. Sometimes, I don't even need a reason!